Chester Cathedral was having an Open Day today (there is usually a fee for entry) so that was a good excuse for a trip to Chester. 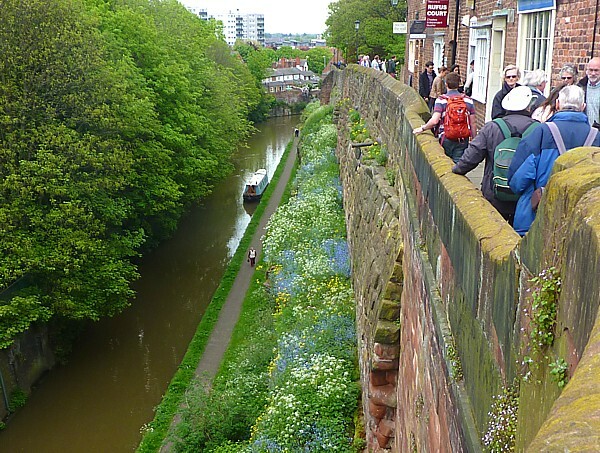 We walked down the hill from the station and onto the canal. Our attention was immediately caught by a single tiny duckling. It was peeping desperately and its legs were going furiously. Clearly it was lost and panicking. Other Mallard mothers with older broods were seeing it off aggressively. 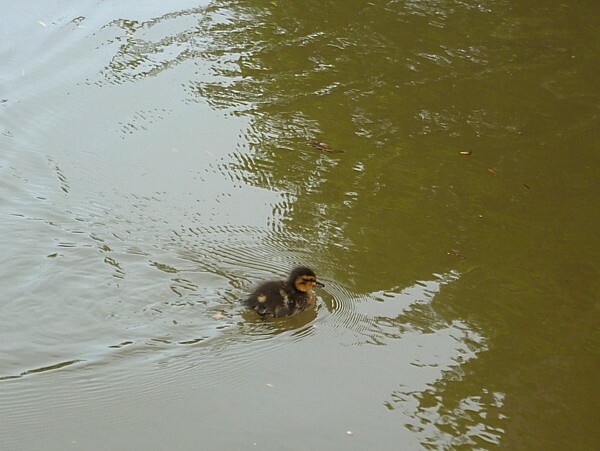 We could see some other very tiny ducklings a long way off but our stray was going the wrong way! 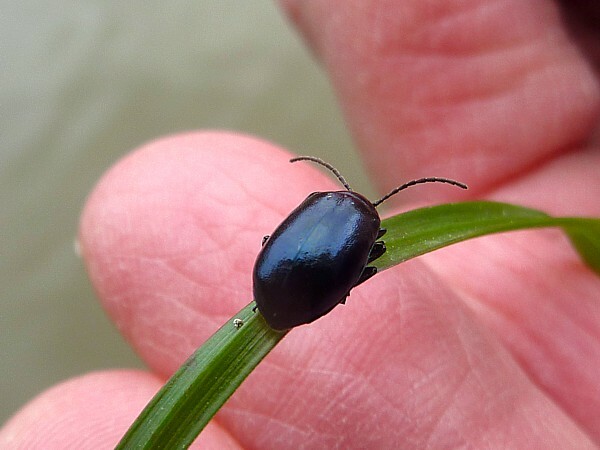 We thought of catching it, but it shied away from hands, so no chance of that. Then five other little balls of fluff of about the same age appeared from behind the narrowboats and it swam off with them, but there was still no mother duck in sight. The little ones weren’t going to last long without her, we thought. More bad bird parenting was evidenced by a lone Moorhen chick further along. There was a lovely display of flowers along the edge of the canal. Lady’s Smock, a big mass of Cow Parsley and Bluebells, Buttercups, and one that looked like a Buttercup but wasn’t. Only four petals and long thin seed pods. 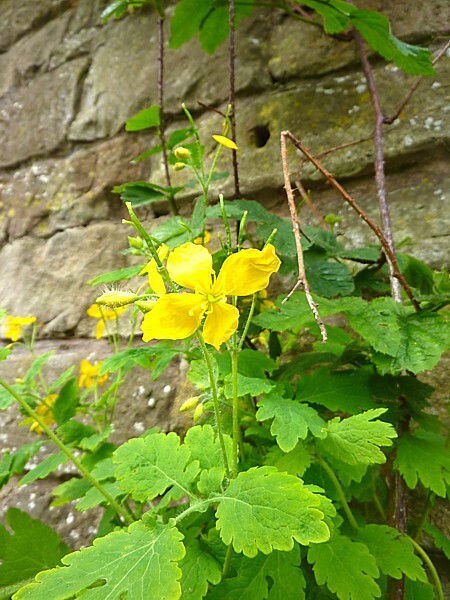 Margaret identified it as Greater Celandine, which is a member of the poppy family, and not related to the Lesser Celandine at all. In the steep sandstone cutting before Northgate Lock we noted Hart’s Tongue fern on the damp wall, surrounded by the Common Liverwort. 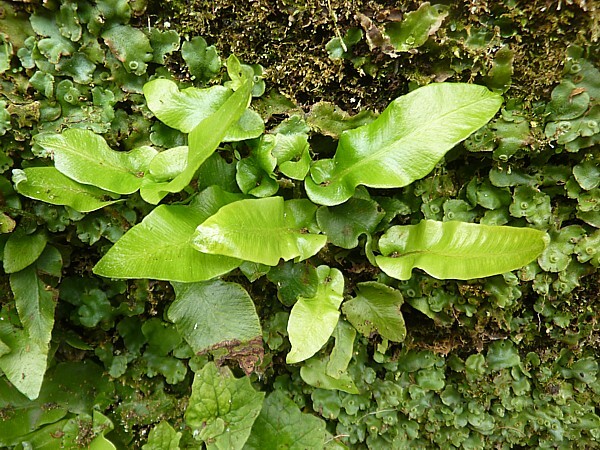 The little cups on the liverwort “leaves” (the thallus) contain tiny reproductive particles called gemmae. 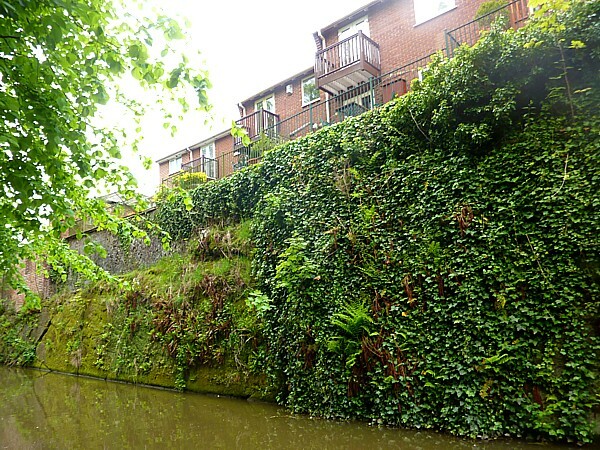 The opposite wall had a profusion of life, with ivy, ferns, and young Sycamore trees clinging to the vertical rock face. 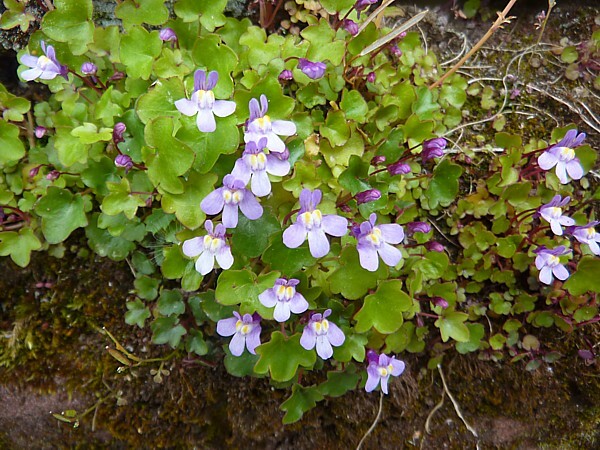 Where it was light and dry again there were clumps of the very pretty little Ivy-leaved Toadflax. 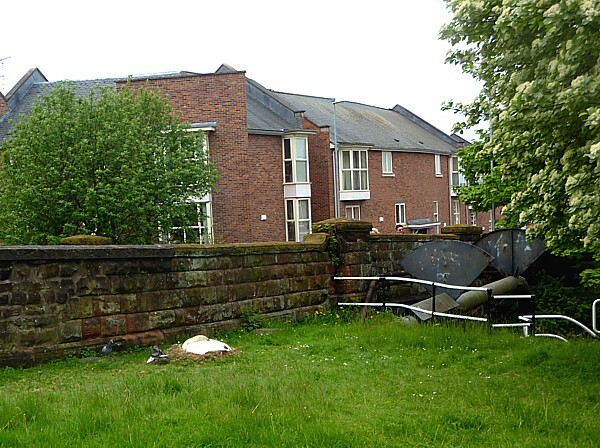 We lunched in our usual spot opposite the Telford warehouse. A Mute Swan was nesting on the verge in a horribly unsuitable spot. She was by the wall next to South View Road, accessible to everyone walking by. 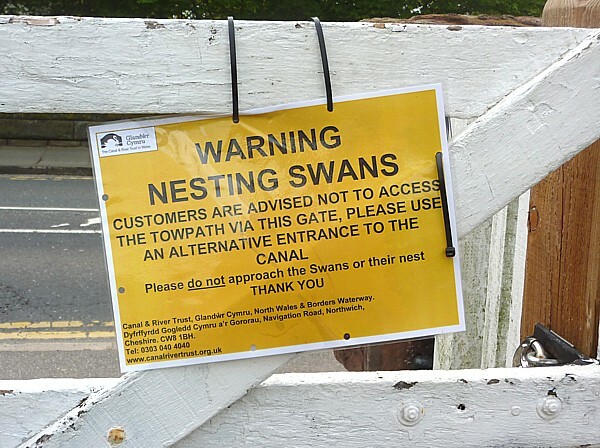 The Canal and River Trust in Wales had put up warning signs, so I hope she isn’t bothered. 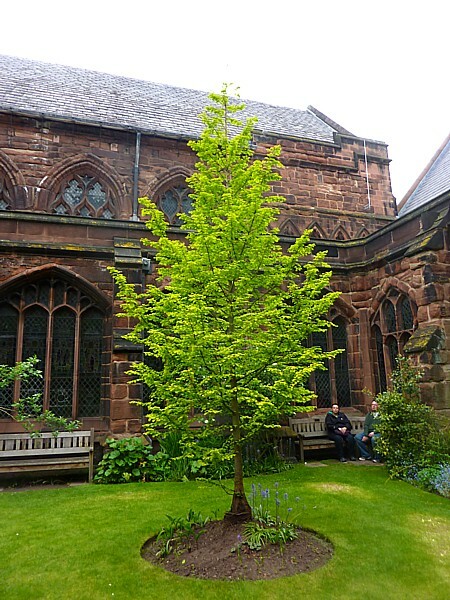 Then along the walls to Chester Cathedral. 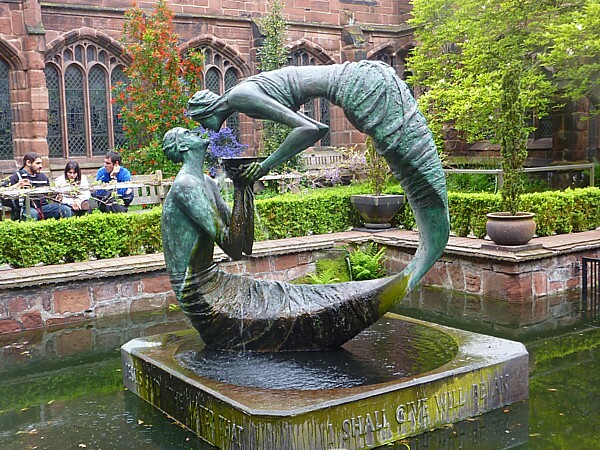 We looked at the windows and monuments, then went into the Cloister Garden, to look at the “Water of Life” sculpture by Stephen Broadbent. We were more interested in the plants, especially that red one behind the sculpture. 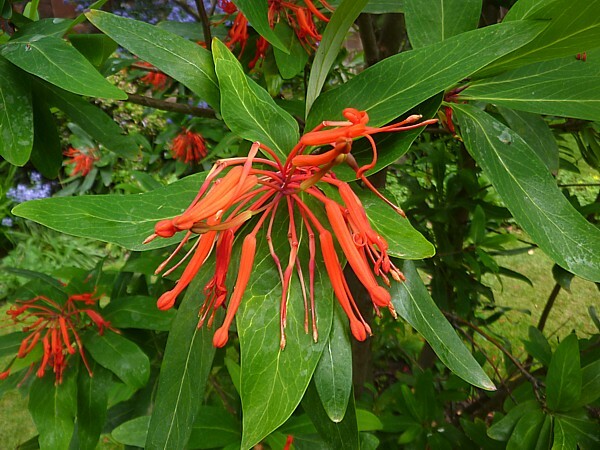 Margaret suggested Chilean Fire Bush as a possibility, and she was right. In the far corner was a lovely young tree with (happily) a name tag. 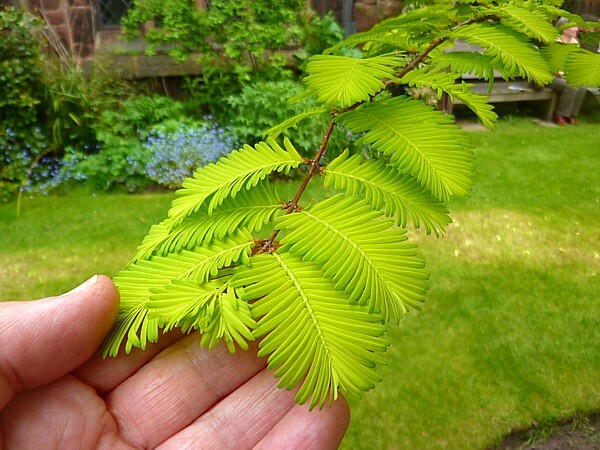 It was a golden Dawn Redwood Metasequoia glyptostroboides “Goldrush”. 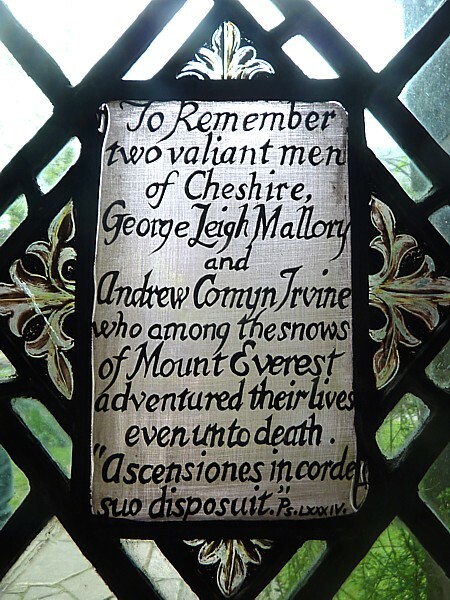 On the way back into the cloister I spotted a tiny window to Mallory and Irvine who were lost on Everest in 1924. The words Ascensiones in corde suo disposuit are from Psalm 84 and translate as “In his heart he has set the heights”. Public transport details: 10.15 train to Chester, arriving 10.55. Returned to Liverpool on the 2.30 train, arriving Liverpool just before 3pm.